Purpose: Use this document as a reference for sending student financials communications in ctcLink. Prior to generating a communication, a letter code must first be assigned to the student. See Create a Communication to complete this step. Search for an existing Run Control ID or Add a New Value if this is the first time running the process. Select the ID Selection from the dropdown. Enter or select the Letter Code for the appropriate institution and process. The Letter Code selection populates other fields with default values. Typically, these should not be changed. Make a selection in No Matching Template Found – typically Use Default Template. Select the Communication Method Usage. For this example, E-Mail is selected. Navigate to the Process Parameters tab. Choose the Address, Address Name, Salutation and Extra Name. Check Use Preferred Email Address. 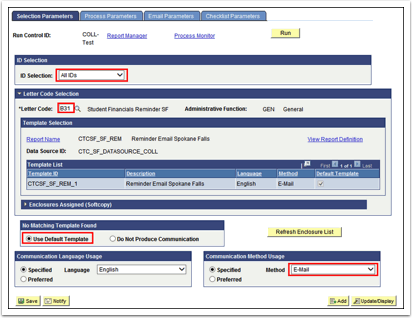 Select an Org Recipient and Contact Name value if the communication has been designed to send to both students and communications. Enter the Communication Date Range Selection From Date and To Date. 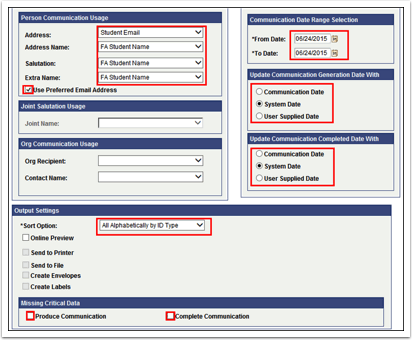 Select the Update Communication Generation Date With and the Update Communication Completed Date With to specify the date to record the communication on the student record. Select the preferred Sort Option. Un-Check the Produce Communication and Complete Communication in the Missing Critical Data section. Navigate to the Email Parameters tab. Enter the From, Subject and Reply to. Leave Sender and Bounce to blank. Leave the Importance and Sensitivity values defaulted to normal. 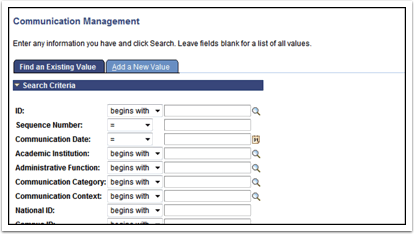 The Checklist Parameters page settings should not be changed. Click Run and OK to run this process. 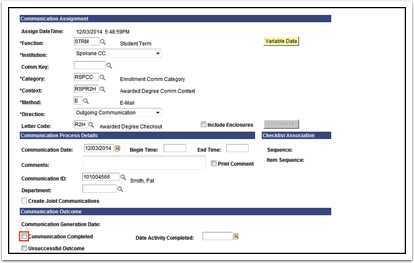 Enter a student ID from the prior process and click Search to review communications recently sent. If the Communication Completed checkbox at the bottom of the Person Communication page is checked, this indicates the email was sent. Click on the View Generated Communication link to view a .pdf of the communication that was generated.